​I can almost see the confusion on the faces of Andrew and Philip. They went to tell Jesus there were visitors and he responds with talk of farming and lonely wheat and dying to bear fruit. We have a different perspective today than they did then and we know Jesus was talking about his own death, burial and resurrection. The farming-wheat-dying-fruit analogy He gave also applies to his followers today. Just as it was an image of Christ’s literal death, burial and resurrection, it is also an image of Christian’s literal death, burial and (eventual) resurrection. It is also an image of Christian’s spiritual death to self, being rooted in Christ and reborn to bear spiritual fruit. Clearly, we are the grain of wheat mentioned in today’s scripture. But let’s consider the life span of an actual grain of wheat. Seed —> planted in soil —> roots & first leaves form —> roots & leaves grow —> grain heads develop —> wheat is harvested —> seed gathered —> planted, etc..
To simplify even further, there is planting, dying, growing and producing. It does seem odd to have dying in the middle of the life-cycle instead of the end, but somewhere in the middle, what was planted dies and becomes something else. ​Dying to self is part of being “born again” when the old self dies and the new self comes to life. (John 3:3-7). In practical terms, it can be described as putting aside what we personally want in the moment to focus on loving God. It moves us away from self-centeredness and closer to Christ. So what does this look like in our lives? ​Right in the middle of today’s scripture three words grabbed me - “unless” and “into” and “alone”. The processes of planting the seed and dying to self may explain where the action occurs, but they can’t be done alone. There must be a catalyst, a stimulant, a food source. 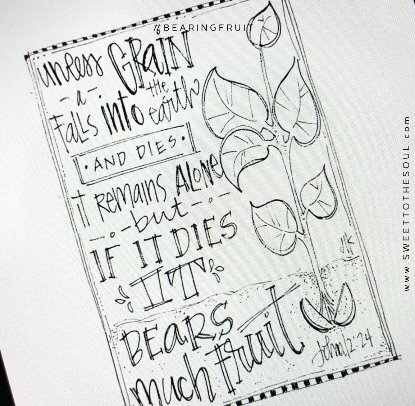 In order to bear fruit, we must be “into” our food source, and our food source is God. ​Let's make a recommitment to God, to put aside our personal desires and to focus on God and his will for our lives. Let's be fruit bearers. 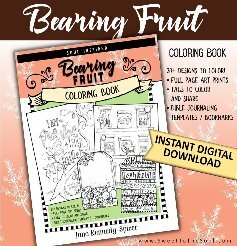 ​The color page of todays scripture is included in our ​Bearing Fruit - Soul Inspired Scripture Coloring Book. Oh, please read it in context. I love your art, but this statement comes on the tail end of some Greeks wanting to see Jesus. 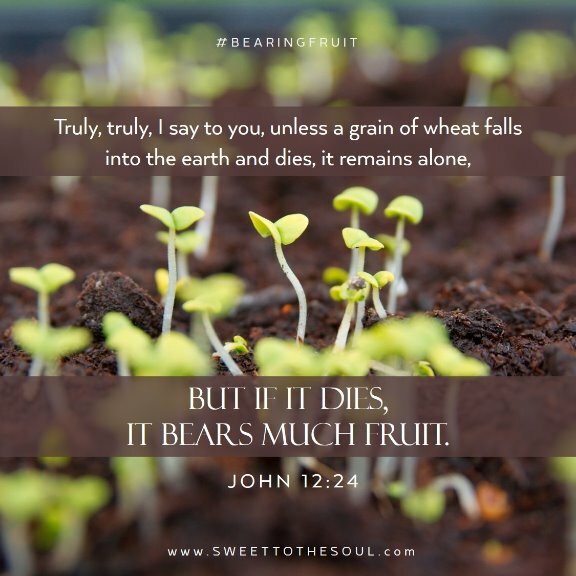 Jesus has not yet died and been raised as savior to all, so unless this seed (Christ) falls in the ground and dies, He alone will remain the only sinless person. But if HE dies, HE will bring forth the harvest to the Father. We are not the seed. We can never be the seed, but He can be the life of that seed in us, and in receiving Him, we can therefore walk according to His life.